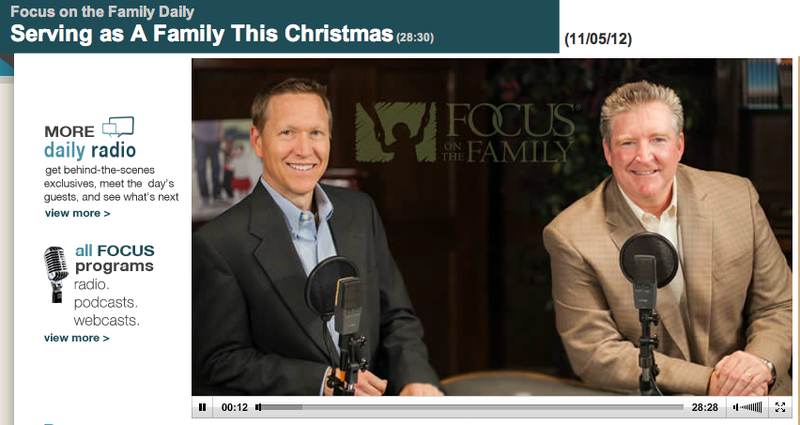 Ok, so in having a day of organizing, I listened to Focus on the Family again and heard this amazing broadcast on serving families this Christmas. I hope you are able to set about 20 minutes aside and play it off your phone, iPad, or good old fashioned computer. I try to listen to these when I'm doing a particularly unenjoyable task (such as cleaning or working out) so as to take my mind off the task. So maybe you can do the same. I really feel like the ideas they have are so simple I'm surprised I haven't thought of them. They start off talking about simple things you can do together and then move into a retelling of an amazing story from an Operation Christmas Child recipient. If you do OCC, it's worth your time. Money back guarantee- oh wait, it's free... ok seriously though. Make it a point to listen to it. You won't be disappointed! It is the most touching story I've heard in a while. The kind where you need tissues nearby. If you do nothing else this season I urge you to consider Operation Christmas child. In order to not confuse or take away from this, I will post stuff about Operation Christmas Child in another post. Resources for you this week and next semester! Who hooo! So exciting! Ooh, this is soooo good. Grab your tissues! !